If you’re in the market for a new car these days, you might find yourself shying away from the domestic automakers. With news of increasing debt, failed government bailouts, plant closings and ever mounting layoffs, it’s easy to think the future looks dim for the Big Three. However, there are plenty of rides out right now, or within a few short years of production, that show innovation isn’t dead stateside, and that Ford, General Motors and Chrysler are capable of producing quality vehicles that can go toe to toe with their import counterparts. America has great vehicles in just about every price range, but here are our top 5 for under $30,000. 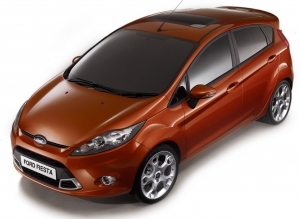 For those of you who remember the original Ford Fiesta as a hideously boxy windup, try and put that image behind you. The newest Fiesta due out next year sports some genuinely attractive styling outside, but what really makes this car shine is the two available motors. While neither are exactly powerhouses, both should return fantastic gas mileage. The 1.6-liter four-cylinder variant should put out close to 120 horsepower—more than enough for such a small car—and still get 40 mpg. For the more thrifty minded out there, a lower displacement model will be available with only 90 horsepower. That mill should hit the pumps at a feather-light 64 mpg. What’s really remarkable about this car is that its fuel economy is gleaned from smart engineering and a focus on improving efficiency throughout the vehicle. The 2010 Fiesta isn’t hindered by heavy hybrid battery packs or complicated energy recovery systems—keeping costs low for everyone involved. This car is exactly what America has been clamoring for: a stylish, affordable vehicle with great gas mileage. The Fiesta should be able to take on the likes of the Toyota Yaris, Honda Fit and Nissan Versa without breaking a sweat. We’ll have to wait a little while before we can sink our teeth into GM’s answer to the cry for a fuel-efficient, economical vehicle, but from what we’ve seen so far, it’s clear this car is a step in the right direction. General Motors has ditched the bland styling of the Aveo and Malibus of old for a few new sharp lines that make up the Cruze’s stylish front end. Just like its Blue Oval rival, the Cruze should serve up some stellar fuel economy thanks to a turbocharged 1.4-liter engine, and a first in its class optional six-speed manual transmission. Turbocharging an engine is a simple way to extract more power out of the same displacement. By forcing a larger air charge into the cylinder than would typically be accepted, the engine generates more power with marginally more fuel. Our cousins in Europe have been driving turbo diesel and gasoline engines for decades now because of the fantastic performance, and the fact that GM is looking in that direction should be good for everyone, especially considering the Cruze’s 45 mpg target. A clear example of just how well turbocharging a vehicle works, the Pontiac Solstice GXP serves up 260 horsepower out of a 2.0-liter four-cylinder engine. In that configuration, the car gets 25 mpg city and 28 mpg highway. Those numbers rank a full 6 mpg city and 9 mpg highway better than the non-turbocharged 2.4-liter four cylinder base model with just 170 horsepower. While the figures on this car are impressive, the real revelation comes from behind the wheel. The Solstice GXP is a head turner no matter where you go. Even from behind the wheel it’s clear you’re piloting an attractive vehicle. Mash the accelerator and this car’s capabilities come into strict focus. Pontiac did their homework when it came to this roadster, serving up remarkable handling and an incredibly responsive motor that makes for a lethal track vehicle. It’s something we wouldn’t have seen coming from Pontiac 10 years ago, and we like it. Unfortunately, the Pontiac Solstice and its brother, the Saturn Sky, are expensive to produce. A faltering automotive industry means that the priciest models go first, and in this case, GM has announced that it has no plans to continue the Solstice line, and that’s a shame. It’s a great alternative to cars like Honda’s S2000 and Mazda’s MX-5 Miata. We’re not exactly sure when it happened, but at some point Detroit realized that economical vehicles didn’t have to be embarrassing to drive. The Geo Metro was capable of 50 mpg in 1989, but you had to sign away your pride when you bought the car. Ford’s reinvention of the Focus for 2008 showed that cheap transportation doesn’t have to fit like a cheap suit. The Focus is a good-looking ride inside and out with bold side details and a clean, well designed nose. It’s a car you can be proud to drive. Even with a base price of around $14,995, the interior doesn’t feel like it’s going to fall apart in your hands. Bottom of the barrel trim levels still offer great seats and a quiet, comfortable ride. What’s more, all of the good looking, better feeling characteristics come in a package capable of mid-to-high 30’s fuel economy. That’s on par with compact Japanese rivals like the Honda Fit and Toyota Yaris. In the U.S., pickup trucks dominate auto sales. The F-150 routinely out sells the likes of the Toyota Camry and Honda Accord despite fuel economy that can be described as dismal at best. With gas prices occasionally ticking past the $5.00 per gallon mark, Ford set about easing the burden at the pumps. For 2009, the F-150 range will get a new SFE version, short for Superior Fuel Economy. While we wouldn’t go so far as to call the fuel economy “super,â€ it is a marked improvement over previous models. The F-150 SFE uses a number of innovations to bump the vehicle’s mileage up, including low-rolling resistance tires, new three-valve-per-cylinder heads and a six-speed automatic transmission. Previous iterations of the truck were cursed by a four-speed auto. The saving tricks are good for 15 mpg city and 21 mpg highway—nearly unheard of for a full-size pickup. Of course, all the mileage in the world won’t sell the vehicles if they’re worthless as a truck, which is why Ford made sure the SFE had an incredible towing capacity. The 2009 Ford F-150 SFE can still pull 7,500 lbs—plenty for the average person.